Here’s one of my favorite uses for vegan sausage. 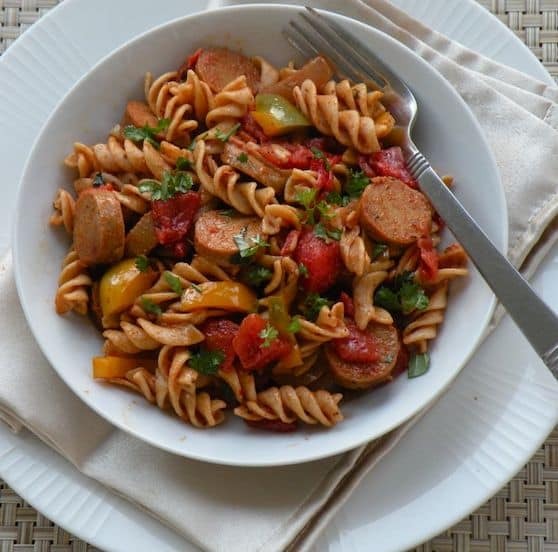 The bold flavor is used to full advantage in this hearty Creole-flavored pasta dish. If you have more time, make a pan of vegan corn bread, it’s a wonderful addition to this meal, as is Creole Coleslaw. Meanwhile, heat the oil in a large skillet or stir-fry pan. Add the onion and sauté over medium heat until translucent. Add the garlic, celery, bell pepper, and sausage; continue to sauté until all the vegetables are lightly browned. Add the tomatoes, paprika, and thyme. Continue to cook for 6 to 8 minutes. Stir in the cooked pasta. Season with cayenne or red pepper fakes, salt, and pepper. Stir in the fresh herbs, reserving some for garnish if you’d like, then serve. 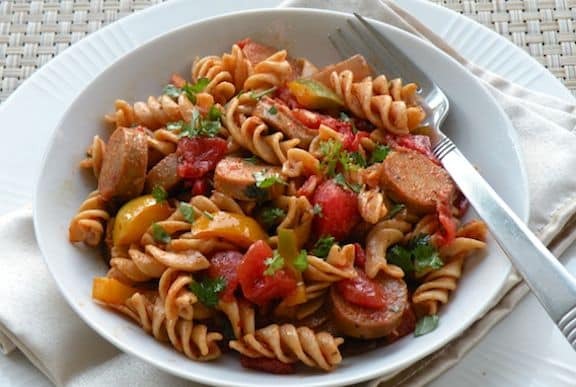 Find more of VegKitchen’s Vegan Dinner Recipes andPasta Entrées. Where does one get these ingredients in the UK? I Do not eat soya products, which I admit makes it a little more difficult ..